Since the 2016 presidential election, analysts and strategists across the liberal-left spectrum have debated which voter groups should be the main targets of outreach and organizing in preparation for the elections of 2018 and 2020. With the results of the November 7 races in Virginia and elsewhere, such debates can finally be enriched by a large set of post-2016 voting data. But beyond their popular interpretation as a stinging rebuke of Donald Trump, what lessons can we glean from these data as we turn to 2018? Just as importantly, what are the limits on what these races can teach about national politics—even in the case of large statewide elections in “purple” Virginia? Can we really learn anything new from these contests? In this essay, I examine the main outcomes from Virginia’s 2017 gubernatorial and legislative elections, and how they are coming into dialogue with key debates about the post-2016 electorate. I identify a few compelling developments in Virginia, most notably around turnout among voter groups often assumed to be “unmotivated” in “off” (non-presidential) years. I also analyze the takeaways from the Virginia elections that early commentaries are trumpeting, and where they might lead if adopted by progressives going into the 2018 midterms. This essay ultimately aims to speak to a debate that has become pervasive in the post-2016 context. It is a debate over whether progressives are better served by focusing on winning over (or back) the least partisan among Trump’s 2016 voters, or by activating greater numbers of voters from left-leaning demographic groups. But in order to inform this debate, we must first revisit one of its premises that takes us back to factual questions about what happened in 2016. Since last year’s presidential election, many analysts have advanced the idea that there was a “Trump effect” that animated white voters without a college degree (often labeled “the white working class”), especially in the Rust Belt. Here a Trump effect would mean that something unique to Donald Trump’s platform, candidacy, and/or person connected with this voter group in a way unprecedented in recent memory. It asserts for Trump a singular ability to pull white voters without a degree away from the Democrats, and draw those who don’t regularly vote to the polls. [Non-college whites'] increase as a share of the vote owes just as much to depressed turnout among voters of color. The claim of a Trump effect surely warrants serious consideration. Beyond the fact that Trump breached the Democrats’ so-called “Blue Wall” in the Upper Midwest, many of the counties in which Trump most out-performed Mitt Romney were also counties disproportionately comprised of whites without a degree. Among these were the Michigan counties that touch Lake Huron, most of eastern and southern Ohio, northern Pennsylvania, and Appalachia, including western Virginia.1 In the immediate aftermath of the election, a striking set of figures from the national exit polls began to circulate: Donald Trump carried 66 percent of white non-college voters while Hillary Clinton won a meager 29 percent – an enormous 37-point gap. Adapted from: Geoffrey Skelley, “Another Look Back at 2016,” Rasmussen Reports, March 23, 2017. So if the non-college white vote share was higher than expected, doesn’t this imply that there still was a “Trump effect,” but located more in a turnout spike than a vote-switching one? To some extent, yes—but only with caveats. Looking at white non-college turnout alone, the group participated at higher rates than in 2012, but only modestly so. The turnout rate for whites without a degree went up by less than a percentage point, to 57.8 percent. Nonetheless, due to the size of this population of eligible voters, this is a noteworthy increase in raw voter numbers. But equally responsible for white non-college voters maintaining over a 40-percent share of the electorate was the decrease in turnout among voters of color. In this regard, African Americans under age 45 particularly stand out, as they dropped to their lowest rates of participation since 2000. In the Upper Midwest, counties with large concentrations of African American voters had steep declines in turnout. Milwaukee County, Wisconsin saw 51,500 fewer voters in 2016 than in 2012, and Wayne County, Michigan saw 38,000 fewer. In both cases, these numbers are well over twice the margins by which Trump carried the counties’ respective states. The claim of a special “Trump effect” in 2016 is overblown. The rate at which whites without a degree turned toward the GOP that year conformed to a longer historical trajectory of this group. Unfortunately, we have yet to see adequate research on non-voters to be able to explain these trends fully. A study commissioned by Democratic super PAC Priorities USA, surveyed 800 Democrat-leaning occasional voters in March and April, and found that Trump’s “unfavorable” ratings among them were astronomical. Even among the 400 in this group that chose not to vote in 2016, 73 percent said they have “very unfavorable” opinions of Trump. It could be that many of these did not vote because they assumed Clinton would win anyway.4 But it also seems likely that, despite their negative feelings toward Trump, many eligible voters stayed home due to lack of confidence or excitement about Clinton. Whatever the causes of voter abstention, the paragraphs above show that the claim of a special “Trump effect” in 2016 is overblown. The rate at which whites without a degree turned toward the GOP that year conformed to a longer historical trajectory of this group. Their turnout was up, and Trump very likely deserves some credit for this. However, the group’s increase as a share of the vote owes just as much to depressed turnout among voters of color. But there is an exception: white voters without a college degree. Though this group supported Northam at a slightly higher rate than they did Clinton, it was not at the expense of GOP counterpart Ed Gillespie. In 2016, Trump won non-college white Virginians 71-24; in 2017, Gillespie essentially matched his performance, winning them 72-26. It should be underscored that this is despite that, notwithstanding the ugly final weeks of the campaign, Gillespie is an establishment, “beltway” Republican—not a Trumpian. Even so, as Nate Cohn and Matthew Bloch conclude in the New York Times, compared to other past elections in Virginia—such as the previous gubernatorial race in 2013 or Gillespie’s failed bid for U.S. Senate in 2014—the results in 2017 “looked more like the 2016 presidential election than any other recent election.” That is, demographically and geographically defined segments of the electorate followed the same partisan trends as in 2016. This point holds for the 100 Virginia House of Delegate races in 2017 as well. In fact, here adherence to last year’s voting patterns is arguably even starker. Analysts at the University of Virginia Center for Politics point out that 14 of the 15 Democratic pickups in this legislative body are in districts that Clinton carried in 2016.6 Looking at voter demographics, prior to November, most of the seats representing “majority minority” legislative districts in Virginia were already held by Democrats. With the results of the 2017 election, all of them will be, together with about a dozen more from majority white districts. 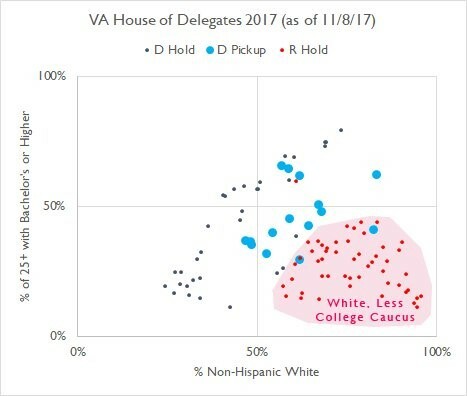 What stands out about the House of Delegate seats that did not flip from the GOP to the Democrats in 2017 is that—almost without exception—they have the whitest populations and the highest percentage of adults (age 25+) without a college degree.7 Data analyst Kenton Ngo has illustrated this well in the graph below. Several special circumstances surrounded the 2017 elections in Virginia, including massive national media attention and influxes of out-of-state volunteers and donations. Yet this has not dissuaded many progressives from rushing to rethink their approach to the 2018 midterm elections in Virginia’s light. As we approach 2018, it is crucial to understand which takeaways from Virginia are getting the most play, how pundits and political operatives are explaining them, and how these explanations are re-shaping conversations about progressive strategy for next year’s midterms and beyond. Earlier in this essay I alluded to a liberal-left debate over post-2016 political priorities. Fundamentally this debate turns on whether to prioritize voter persuasion targeting Democrats and independents who cast ballots for Trump, or to focus efforts on increasing participation among the “Rising American Electorate” (RAE) of people of color, Millennials, and unmarried women.9 Those of us committed to the latter approach often argue for centering outreach on the millions of Obama voters who did not show up to the polls in 2016, or who cast protest votes against both major-party candidates.10 We also stress that overall the RAE tends to align with progressives on the issues more than has been proven to be the case for any sub-group of Trump voters. 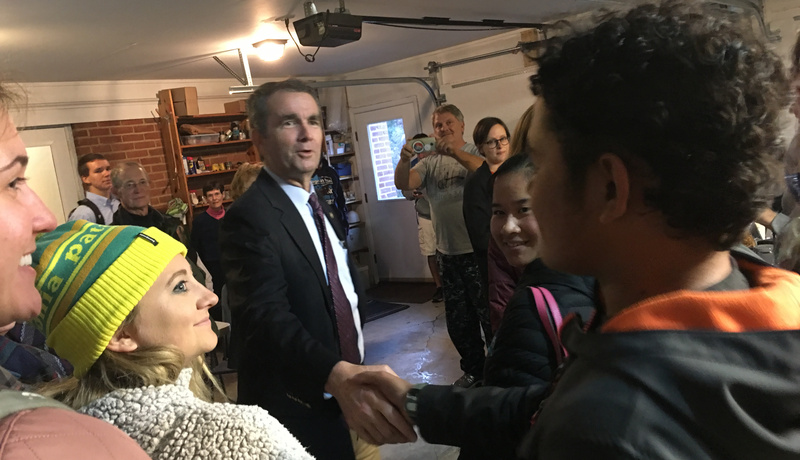 Virginia’s results reinforce the argument for focusing on voter outreach, civic engagement, and power-building with the Rising American Electorate. Here I will not rehearse any further the details of the case for focusing on the RAE—or Obama voters who supported neither Clinton nor Trump—over ostensibly “persuadable” Trump voters. It is worth noting however that those who make that case were beginning to win the debate even before the Virginia elections. This is an important backdrop for understanding the topic at hand: how Virginia appears to be reshaping the debate’s terms. For those who doubted this kind of RAE “surge” was possible in an off year—and without Barack Obama on the ballot—Virginia offers a piece of counterevidence. The results there make it harder to argue that early, active, and meaningful engagement with RAE voters should be anywhere but at the center of progressive political work moving forward. Some leaders of new democracy groups further point out that Virginia demonstrated that down-ballot campaigns that energize RAE voters can be a boon to turnout for less dynamic up-ballot candidates of the same party. As the message about empowering RAE constituents reverberates in progressive strategy circles, an amended set of post-2016 questions emerges: With whom should a new coalition centered on people of color, young people, the LGBT community, and progressive women be built? Thinking of districts in which this core does not reach 50 percent plus one, which allies should progressives invest in courting, or in winning back? Here we find ourselves returning to a familiar—if reductive—choice between two voter groups: “suburban” and “working-class” whites. The second main takeaway from the Virginia elections would appear to seal this choice’s fate: The suburbs went blue. College-educated, middle-class, mostly-white suburban voters came out in force to vote for Ralph Northam and other Democrats—and against Donald Trump. This last part is key, because most of those who spotlight Virginia’s blue suburban wave see it as, first and foremost, a repudiation of the White House. The point they would make from this—echoing Northam’s victory speech—is that higher-income, college-educated whites are eager to vote against the divisiveness and intolerance Donald Trump’s presidency has stoked. Exit poll findings support the idea that feelings about Trump did indeed loom large across the 2017 Virginian electorate.14 But progressives should be wary of how all of this translates into strategy lessons for the coming year (and years). If Democrats won across the board in Virginia because affluent suburbanites joined progressives around tolerance and decency—and non-college whites decidedly did not—then there would seem to be little more to discuss. What would be the consequences though, if consultants, donors, and ultimately the Democratic Party coalesced around the idea that suburban whites are progressives’ new “natural ally”? A first foreseeable one is the scuttling of bold redistributive, regulatory, and economic justice proposals that are gaining traction nationally. Another could be the maintenance of the status-quo formula for Democratic Party candidates—being “boring, competent, [and] decent” as opinion columnist Jennifer Rubin advocates. This is not to say that affluent suburbanites could never support candidates who lean populist on economic issues or who bring unique or underrepresented perspectives to the ticket. To the contrary, there were districts in Virginia where they did just that! It is to say, however, that the demographic reductionism in which political consultants and party leaders operate is likely to turn stereotypes of suburban voters into a case for pallid agendas and candidates. When this happens, it is likely to have the counterproductive effect of squelching much of the energy and excitement—not to mention votes—of RAE constituents. Progressives should also think carefully about the power dynamics likely to follow from a strategy of courting the ideal-typical suburbanite, and of letting him come to look like the only potential partner in the game. Most voters are tired of zero-sum partisanship, and of all politics being about Donald Trump. There is another conclusion that some are drawing from Virginia that is equally worrisome. Recall that many—including Republicans—have noted that the Virginia elections played out like a referendum on Trump. One Virginian GOP congressman emphasized the point to the New York Times by saying, “I know [Republican] folks that lost tonight who were going against candidates I’d never even heard of.” Some are reading this rebuke as a sign that it could be a winning strategy to figuratively “put Trump on the ballot” in 2018. That is, perhaps it would serve Democrats to make congressional races about Trump, tying GOP incumbents to his brand and emphasizing their commitment to stopping his agenda. This strategy could however spell disaster for Democrats. Trump is not very popular according to public opinion polls, but he still seems to be better liked than his party. He also maintains support in many parts of the country with competitive congressional districts. More importantly, most voters are tired of zero-sum partisanship, and of all politics being about Donald Trump. Independent-minded voters in particular do not want their local elections infected with national partisan animus. Fight Back California PAC has been carrying out research in competitive California congressional districts for months, and concludes that national issues tend to polarize the electorate, swing voters want candidates who focus on local issues over ideology, and all voters want representatives who “fit” their districts. If this holds elsewhere, it could be that entirely wrong lessons are being drawn from Virginia’s House of Delegates races. What if it was not that Democrats won in races against Trump despite running candidates political insiders had “never even heard of”? What if they won precisely because they were new faces—and locally compelling candidates? You don’t have to be a student of political campaigns to remember the last time some of the “new” debates following Virginia’s recent elections played out. Indeed, some sound all too familiar. So let’s none of us forget: The last time we watched Democrats take RAE voters for granted—without really empowering them—while barnstorming affluent suburbs and betting on Trump’s negatives as a sure ticket to victory… it didn’t turn out so well. 1. See further Joshua Clark, “What Didn’t Happen? Breaking Down the Results of the 2016 Presidential Election,” Haas Institute for a Fair and Inclusive Society, University of California, Berkeley, CA, November 2017. 2. See Nate Cohn, “Why Key State Polls were Wrong about Trump,” New York Times, May 31, 2017. 4. A Pew Research Center survey found that 25 percent of non-voters—and 1 in 3 non-voters under age 30—said they believed their votes would not matter. 5. With Clinton winning Virginian voters of color by an overwhelming 79-17, there was less room for Northam to grow her margins. However, turnout in communities of color is a significant part of the story of Virginia’s 2017 elections, as I discuss later in this essay. 6. Democrats had picked up 15 seats as of the writing of this essay. Two more remain in limbo due to extremely close vote counts and litigation over unusual changes to a district line. See Laura Vozzella, “With uncanny twists and an allegedly rogue registrar, Virginia House left in limbo,” The Washington Post, November 26, 2017. 7. In 10 of these cases the Republican seat went uncontested in 2017, and in 2 others the GOP candidate had an independent challenger but no Democrat. 8. See Clark, “What Didn’t Happen?”. 9. It is important to note that neither side of this debate tends to see the matter as an either/or—the question has been one of prioritization. 10. This is not to say that all “third-party” votes were protest votes. But for those that were, progressives should hear and take seriously the message these voters meant to send. 11. For breakdowns of change in turnout by region, see Will Houp, “Northam-Gillespie race had the highest turnout in 2 decades for Virginia governor election,” The Virginian Pilot, November 10, 2017. 12. These models are described succinctly in Gregory S. Schneider, “Historic turnout of young voters in Virginia election poses problem for Republicans,” The Washington Post, November 24, 2017. 13. See Michael Tackett, Trip Gabriel, and John Eligon, “A Year After Trump, Women and Minorities Give Groundbreaking Wins to Democrats,” New York Times, November 8, 2017; Dan Keating and Kevin Uhrmacher, “An enthusiastic, more polarized Virginia electorate gave Northam the win,” The Washington Post, November 8, 2017; and Joan Walsh, “Here’s Why Democrats Won Big in Virginia,” The Nation, November 8, 2017. 14. See for example, Philip Bump, “The shifts in Virginia voting that handed Trump an embarrassing defeat,” The Washington Post, November 8, 2017.